In the classical era, monstrous creatures such as the cyclops and the Minotaur appear in heroic tales for the protagonist to destroy. Other creatures, such as the unicorn, were claimed in accounts of natural history by various scholars of antiquity. Some legendary creatures have their origin in traditional mythology and were believed to be real creatures, for example dragons, griffins, and unicorns. Others were based on real encounters, originating in garbled accounts of travelers' tales, such as the Vegetable Lamb of Tartary, which supposedly grew tethered to the earth. 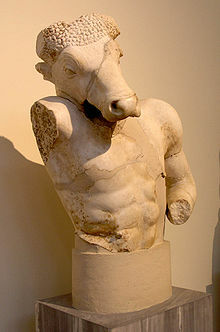 In classical mythology, the Minotaur was defeated by the hero Theseus. Medieval bestiaries included mythical animals like the monoceros (above) alongside real animals like the bear. A variety of mythical animals appear in the art and stories of the Classical era. For example, in the Odyssey, monstrous creatures include the Cyclops, Scylla and Charybdis for the hero Odysseus to confront. In other tales there appear the Medusa to be defeated by Perseus, the (human/bull) Minotaur to be destroyed by Theseus, and the Hydra to be killed by Heracles, while Aeneas battles with the harpies. These monsters thus have the basic function of emphasizing the greatness of the heroes involved. Some classical era creatures, such as the (horse/human) centaur, chimaera, Triton and the flying horse, are found also in Indian art. Similarly, sphinxes appear as winged lions in Indian art and the Piasa Bird of North America. In medieval art, animals, both real and mythical, played important roles. These included decorative forms as in medieval jewellery, sometimes with their limbs intricately interlaced. Animal forms were used to add humor or majesty to objects. In Christian art, animals carried symbolic meanings, where for example the lamb symbolized Christ, a dove indicated the Holy Spirit, and the classical griffin represented a guardian of the dead. Medieval bestiaries included animals regardless of biological reality; the basilisk represented the devil, while the manticore symbolised temptation. Physical detail was not the central focus of the artists depicting such animals, and medieval bestiaries were not conceived as biological categorizations. Creatures like the unicorn and griffin were not categorized in a separate "mythological" section in medieval bestiaries,:124 as the symbolic implications were of primary importance. Animals we know to have existed were still presented with a fantastical approach. It seems the religious and moral implications of animals were far more significant than matching a physical likeness in these renderings. Nona C. Flores explains, "By the tenth century, artists were increasingly bound by allegorical interpretation, and abandoned naturalistic depictions. ":15 Similarly, the historian Richard Kieckhefer explains, "Magic is not meant to work but to express wishes, or to encode in symbols a perception of how things do or should work." ^ The Encyclopædia Britannica: A Dictionary of Arts, Sciences, Literature and General Information. University Press. 1911. p. 581. ^ Bascom, William (1984). Alan Dundes (ed.). Sacred Narrative: Readings in the Theory of Myth. University of California Press. p. 9. ISBN 9780520051928. ^ Simpson, Jacqueline; Roud, Steve (2000). A Dictionary of English Folklore. Oxford University Press. ISBN 9780192100191. Retrieved 24 March 2013. ^ Large, Mark F.; John E. Braggins (2004). Tree Ferns. Portland, Oregon: Timber Press, Incorporated. p. 360. ISBN 978-0-88192-630-9. ^ Delahoyde, M.; McCartney, Katherine S. "Monsters in Classical Mythology". Washington State University. Retrieved 6 January 2017. ^ Grimal, Pierre. The Dictionary of Classical Mythology. Blackwell Reference, 1986. ^ Sabin, Frances E. Classical Myths That Live Today. Silver Burdett Company, 1940. ^ Murthy, K. Krishna (1985). Mythical Animals in Indian Art. Abhinav Publications. pp. 68–69. ISBN 978-0-391-03287-3. ^ O'Flaherty, Wendy (1975). Hindu Myths: A Sourcebook. Penguin. ^ a b c d e f g Gravestock, Pamela. "Did Imaginary Animals Exist?" In The Mark of the Beast: The Medieval Bestiary in Art, Life, and Literature. New York: Garland. 1999. ^ J. L. Schrader. The Metropolitan Museum of Art Bulletin, New Series, Vol. 44, No. 1, "A Medieval Bestiary" (Summer, 1986), pp. 1+12–55, 17. ^ a b Flores, Nona C., "The Mirror of Nature Distorted: The Medieval Artist's Dilemma in Depicting Animals". In The Medieval World of Nature. New York: Garland. 1993. ^ Kieckhefer, Richard. "The Specific Rationality of Medieval Magic". In The American Historical Review, Vol. 99, Issue 3, 813-836. 1994, 814. Wikimedia Commons has media related to Legendary creatures.